Spirit Hunters. Book 1: The Way of the Fox, by Paul Kidd. Illustrated by Angie Kae (KaeMantis). Raleigh, NC, Lulu.com/Perth, Western Australia, Kitsune Press, September 2014, trade paperback $31.97 (470 pages), Kindle $7.99. Spirit Hunters is set in the realm of traditional Japanese mythology, vaguely around 900 or 1000 A.D. if you know your Japanese history. It begins with the rebel lord Sanuki nō Tazadane trying to annex the lands of Kitsune Mountain. Sura and Tonbo are itinerant Spirit Hunters, traveling throughout Japan looking for evil Spirits to kill – hopefully for pay. Sura is an exorcist priestess of Kitsune Mountain. The two attach themselves to Kuno, traveling with him along an increasingly creepy road to Iris Castle. “She was a nezumi — a rat spirit – slim, petite and grave. Startingly, the girl was pure white. Seen in half-animal form, she had pure white fur and long elegant whiskers. Her long hair was the pure, stark white of new fallen snow. Her eyes – frightened and intelligent – were an astonishing shade of pink. She wore traveling clothes, and carried a pair of kama through her belt. 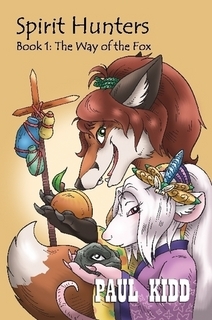 The blades of the little rice sickles were covered with plain wooden sheathes.” (p. 49) The cover by KaeMantis shows Chiri’s two companions, Daitanishi the rock elemental and Biffuko the apparent insect; an air elemental. The four arrive at Ayamejo (Iris Castle) to find a big crowd preparing for the tournament. There is a grisly murder. The Spirit Hunter foursome are suspects. Is the killer one of the humans, or an animal-human, or one of the monsters that the Spirit Hunters are hunting? They unmask the killer together, “With the cunning of the fox, the spirit of the samurai, and the wisdom of the rat.” (p. 195) They make a good team, so they stay together. That is the First Encounter: Silent Death, 201 pages. The other two stories in Book 1: The Way of the Fox are Second Encounter: The Hungry Ghost, and Third Encounter: Sea of Troubles. “These are the first three adventures of the Spirit Hunters saga.” Will there be more? There already are. Paul Kidd is a Greymuzzle from the 1980s, active in furry fandom in his native Australia. During 2006, he announced in his correspondence that he was developing Spirit Hunters to be made into a live-action fantasy TV series, and that he had completed two seasons’ worth of scripts. During 2010 he wrote, “I’m writing the 3rd season of my ‘Spirit Hunter’ TV adventure series at the moment – all full of kitsune foxes and rats and evil spirits, oh my. “ Then he stopped talking about it, but now here are what I assume would have been the first three episodes, in book form. So when can we expect Book 2? $31.97? That’s a retail cover price? It pretty much guarantees that everybody will buy the Amazon.com Kindle edition instead. I have some of his books in a wish list. Still unsure if he is a great writer or just a good one (based solely on previews and quotes). Also, not sure why I’m leaving these comments at all. It’s not like anyone will ever read them. Thanks for the comments. Fred likes them no matter what is the topic. These articles get long term traffic, and other readers come along and see them even years later. I haven’t read his books, but based on his role in Furry publishing, he’s worth knowing.